Hope all of you have enjoyed the Game of Chess in the Facebook Messenger. 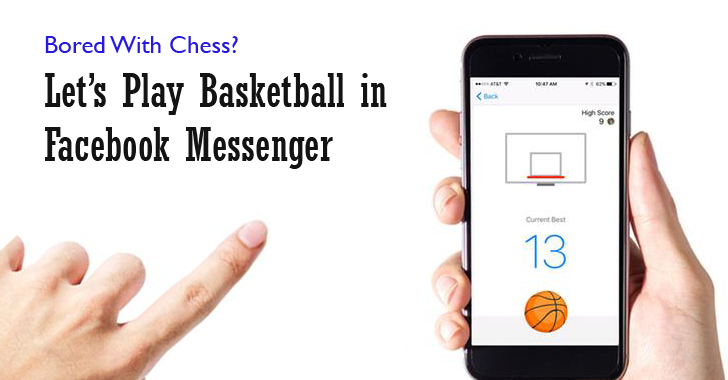 But if you're quite bored playing Chess or not really good at the game, then you probably felt a bit excited about Facebook's recent inclusion of a little Basketball mini-game into Messenger. Now you can play Basketball through Facebook Messenger, just by typing in the Basketball emoji and sending to one of your friends. This would enable a secret Basketball mini-game between you and your friend. Just locate the basketball emoji from your emoji list, send to one of your friends and click it to start the game. Once sent, you would be taken to the Basketball court in a pure white background, where there is no sidebars of any friend suggestions or any promotional ads; only appears a basketball and a hoop, nothing else! Just Swipe up and Toss the basketball into the hoop. A single swipe on your phone in the direction of the hoop to bask in the ball. Facebook also encourages your gameplay with various emojis after each basket. On successful basket, Game appreciates your gameplay by displaying various emojis like Thumbs Up, Hands Up, Claps and Smiles. On a miss, Game warns you by showing emojis like "Surprised", "Feared," and similar. Messenger will also display your scores in between, based on your successful baskets. Your goal is to challenge your friend to see who can get the most consecutive baskets. To play this game, the Facebook users should have the latest version of Messenger installed on their mobile phone. The addition of such mini-games into Facebook's messaging platform would be a loneliness breaker. As this game had been unveiled after a couple of weeks of Chess, let's hope Facebook would integrate more games like caroms or snooker in its upcoming rollouts.